Mortality in prenatally diagnosed neonatal Ebstein's anomaly remains high and outcomes poor. The opportunity to manage this unique patient population presents itself rarely and management strategies present significant challenges. This case report highlights a potential strategy for right ventricular recovery in Ebstein's anomaly. At 25 weeks and 5 days gestational age, routine prenatal ultrasound demonstrated fetal cardiomegaly with an increased cardiothoracic ratio. 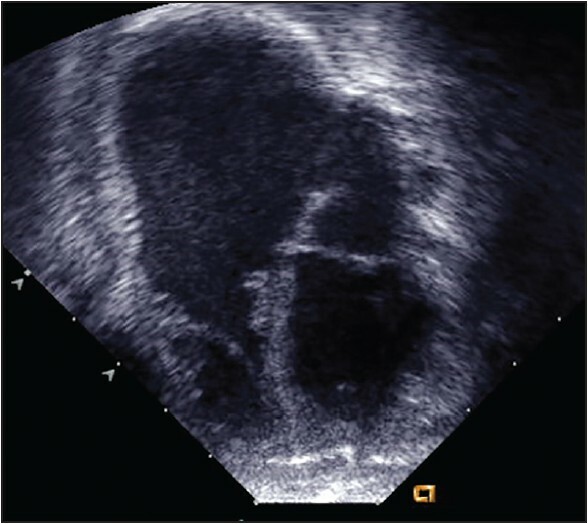 The patient was subsequently referred for fetal echocardiography and was found to have relatively mild apical displacement of the septal leaflet of the tricuspid valve with severe tricuspid regurgitation consistent with Ebstein's anomaly of the tricuspid valve. The right ventricular anterior wall was mildly thinned, and there was right ventricular and right atrial enlargement, with a cardiothoracic ratio of 0.8 [Figure 1]. The peak tricuspid regurgitant jet velocity predicted a peak gradient of 16 mmHg between the right ventricle (RV) and the right atrium (RA), and there was no forward flow across the pulmonary valve. There was bidirectional shunting at the atrial level, and moderate, continuous pulmonary regurgitation across a thickened pulmonary valve. The Doppler pattern in the middle cerebral artery reflected either a high brain resistance or a significant runoff [high pulsatility index of 3.2]. On the basis of these findings, we anticipated a high probability of progression to hydrops fetalis, fetal demise or death in the neonatal period. Maternal treatment with indomethacin was initiated at 28 weeks and 4 days gestation in an attempt to partially constrict the ductus arteriosus and reduce pulmonary regurgitation and systemic steal, thereby improving systemic output. During a follow-up ultrasound at 29 weeks, a mild restriction across the patent ductus arteriosus and a decrease in the middle cerebral artery pulsatility index to 1.9 were noted. Indomethacin dose was limited by the development of oligohydramnios. The maximum flow velocity achieved across the patent ductus arteriosus was 2.9 m/sec, with a dosing regimen of indomethacin of 300 mg/day at 37 weeks gestation. After the fetus experienced late decelerations with contractions, the infant was born via induced vaginal delivery at 38 weeks and 2 days gestation. On delivery, the patient was admitted to the pediatric cardiovascular intensive care unit where she was intubated and mechanically ventilated. Her initial vital signs revealed an oxygen saturation of 82%, heart rate of 172 beats per minute, and blood pressure of 69/29 mmHg. The initial postnatal echocardiogram confirmed the prenatal cardiac findings [Figure 2]. There was no antegrade pulmonary flow, but intermittent opening of the pulmonary valve with continuous pulmonary insufficiency, left-to-right shunting across a large patent ductus arteriosus, and right-to-left shunting across the atrial septum were noted. The cardiac silhouette spanned the chest width on chest radiograph. In the initial 24 hours of life, the patient continued to receive indomethacin to promote ductal constriction. Additionally, inhaled nitric oxide of 20 parts per million, milrinone at a rate of 0.1 μg/kg/min, and dopamine at 5 μg/kg/min were initiated to decrease pulmonary vascular resistance and augment cardiac output. Despite these efforts, the patient was hypoxic, with a PaO 2 of 21 mmHg and serum lactate levels as high as 6.6 mmol/L (66 mg/dL), indicating inadequate systemic perfusion. Given the severity of hypoxemia despite maximal medical therapy, we initiated veno-venous extracorporeal membrane oxygenation. Cannulation was performed using a 12-French dual-lumen catheter in the right internal jugular vein, and flow was initiated at 100 ml/kg/min. On veno-venous extracorporeal membrane oxygenation, the PaO 2 increased to 100 mmHg, and the lactate decreased to 3 mmol/L (30 mm/dL). The patient remained on veno-venous extracorporeal membrane oxygenation and remained mechanically ventilated for 9 days. Daily trials off extracorporeal membrane oxygenation support resulted in severe hypoxemia, although the PaO 2 showed an upward trend on sequential daily trials. The values after 5 minutes off veno-venous extracorporeal membrane oxygenation are listed: Day 1 PaO 2 was 18 mmHg with arterial saturation of 25%, Day 2 PaO 2 was 23 mmHg with arterial saturation of 39%, Day 3 PaO 2 was 20 mmHg with arterial saturation of 27%, Day 4 PaO 2 was 24 mmHg with arterial saturation of 36%, Day 5 PaO 2 was 26 mmHg with arterial saturation of 49%, Day 6 PaO 2 was 23 mmHg with arterial saturation of 37%, and Day 7 PaO 2 was 36 mmHg with arterial saturation of 61%. On Day 6 of veno-venous extracorporeal membrane oxygenation, there was echocardiographic evidence of minimal antegrade pulmonary blood flow (0.06 m/s) and minimal diastolic pulmonary insufficiency in a setting of a small to moderately sized patent ductus arteriosus. On Day 7 of extracorporeal membrane oxygenation support, the patient was taken to the catheterization laboratory where the patent ductus arteriosus was found to be very small. It was, therefore, decided to stent the patent ductus arteriosus and augment pulmonary blood flow. Echocardiography after stent placement revealed a peak instantaneous pressure gradient of 40 mmHg with a mean aortic to pulmonary artery pressure gradient of 20 mmHg. There was no evidence of pulmonary insufficiency or opening of the pulmonary valve. The patient was separated successfully from veno-venous extracorporeal membrane oxygenation 2 days following stent placement, with O 2 saturations on average of 89% on minimal conventional ventilatory settings with FiO 2 of 50%. Over the next two months, the patient remained hospitalized, and underwent two stent dilations. Following the first stent dilation, the pulmonary vascular resistance remained elevated, and the patient, while under consideration for a bidirectional Glenn, was deemed a poor candidate. After the second dilation, the mean pulmonary artery pressure was 40 mmHg, and O 2 saturations ranged from mid-80s to low-90s. The patient became tachycardic, tachypneic, and subsequently suffered a cardiac arrest approximately 23 hours after leaving the catheterization laboratory. Following the cardiac arrest, the patient suffered significant neurologic injury and multisystem organ failure. The patient died at 3.5 months of age. Prenatally diagnosed Ebstein's anomaly is associated with high mortality rate, with survival in affected fetuses reported to be 38%-85%. , Although there have been advances in diagnosis and grading of these patients, outcomes remain poor. ,,,, Of particular importance is the association between prolonged patency of the ductus arteriosus and mortality. Closure of the patent ductus arteriosus allows for decreased pulmonary artery pressure and afterload reduction of the RA, thus encouraging antegrade blood flow across the pulmonary valve. Additionally, the goal of postnatal management is to allow pulmonary vascular resistance to fall and ultimately determine whether the RV can provide adequate pulmonary blood flow. This case presentation highlights a potential paradigm shift regarding the management of severe Ebstein's anomaly: The use of veno-venous extracorporeal membrane oxygenation to provide adequate oxygenation as pulmonary vascular resistance falls after transition from fetal to neonatal life. The administration of fetal indomethacin is currently under investigation by other institutions, and outcomes regarding its use have yet to be published. Other institutions have proposed the use of maternal hyperoxia therapy in fetal Ebstein's anomaly -either as a brief or chronic course to determine whether forward flow across the pulmonary valve can be demonstrated in utero, or as a method to chronically promote pulmonary vascular remodeling. This is based in the fetal monitoring observation of the use of indomethacin and its role in constriction of a patent ductus arteriosus. In this case, the intended degree of fetal patent ductus arteriosus constriction could not be achieved (due to recurrent oligohydramnios) and provided only modest restriction at most; thus, it did not allow the desired effect of promoting blood flow across the pulmonary valve. The use of milrinone and nitric oxide in this patient did not adequately affect pulmonary vascular resistance or augment right ventricular output to provide antegrade blood flow across the pulmonary valve as intended and as previously described. , By current standards, a patient with proven ductal dependence would require a stable aorto-pulmonary connection to maintain adequate oxygenation, which would ultimately destine the patient for univentricular palliation. Patients with neonatal Ebstein's anomaly who require surgical intervention have an overall survival rate of 66.7% in the first year of life. The best option for the treatment of these patients is to attempt antegrade pulmonary flow to ultimately reach a one and a half ventricle circulation. For this reason, our group did not wish to immediately resort to an aortopulmonary connection in an attempt to improve patient outcome. The use of veno-venous extracorporeal membrane oxygenation allows pulmonary vascular resistance to fall, so that the RA may then eject forward into a lower resistance bed. Appropriate patient selection for this approach is essential, and relies, in part, on the selection of patients in which the RA contractile function remains intact. Thus, confirmation of a tricuspid regurgitant jet above a certain threshold is helpful. Once determined that the RV can eject, allowing the pulmonary vascular bed the time to remodel and the RA to adapt to the load may lead to adequate antegrade blood flow and thus to oxygenation in the setting of a closed patent ductus arteriosus. It is possible that prenatal hyperoxia therapy may assist in shortening the time for pulmonary vascular resistance to drop; however, this is purely speculative at this point. In the past, veno-arterial extracorporeal membrane oxygenation has been used in the treatment of severe neonatal Ebstein's anomaly with various indications including intractable dysrhythmias, support during high-risk interventional procedures, low cardiac output, or bridge preceding heart or heart and/or lung transplantation. ,,, The use of extracorporeal membrane oxygenation is not novel in this population and is included as an approved use for the hypoxemic patient, particularly patients with the diagnosis of Ebstein's anomaly. However, the use of veno-arterial extracorporeal membrane oxygenation unloads the volume on the heart and increases the afterload on the ventricle. Overall survival rate of infants with Ebstein's anomaly placed on veno-arterial extracorporeal membrane oxygenation is 34%. Our overall strategy was to allow for pulmonary vascular bed and right ventricular remodeling while continuing measures to reduce right ventricular afterload with inhaled nitric oxide and milrinone without removing all right ventricular work. In contrast to veno-arterial extracorporeal membrane oxygenation, the volume load on the RA does not change when veno-venous extracorporeal membrane oxygenation is used for support. To the best of our knowledge, this is the first reported case where veno-venous extracorporeal membrane oxygenation in a patient with neonatal Ebstein's has been used as bridge to a bi-ventricular repair. It is possible that this patient would have benefitted from a longer period on veno-venous extracorporeal membrane oxygenation, as there were modest improvements in PaO 2 values during trials off the circuit. The decision to keep a patient on a prolonged course on extracorporeal membrane oxygenation must always be weighed against risks and contraindications. Stroke, increased bleeding risk secondary to anticoagulation, infection, continued intubation, and mechanical ventilation may complicate extracorporeal membrane oxygenation use. This patient did not suffer any adverse events during the 9 days of support, and in the future we plan a time limit of a 14-day veno-venous extracorporeal membrane oxygenation course until failure is declared. Planning for extracorporeal membrane oxygenation separation should be guided by the patient's ability to maintain oxygenation when separated from support. In the case of this patient, our goal once the patent ductus was stented was to allow the patient to follow along the single ventricle pathway. Unfortunately, a bidirectional Glenn could not be performed, as initially the pulmonary vascular resistance remained elevated. When it did fall to acceptable Glenn hemodynamics, the infant suffered cardiac arrest following second ductal stent dilation. Our experience underscores the essential clinical questions as to whether a seemingly under conditioned RA can provide antegrade pulmonary blood flow to maintain a PaO 2 greater than 35 mmHg after the pulmonary vascular resistance falls. Experience tells us that, in these patients, gradual changes are better tolerated, and for this reason we relate this approach of supporting the patient with veno-venous extracorporeal membrane oxygenation while allowing for changes to occur and the cardiovascular system to adapt. Nonetheless, more investigation is required to understand and manage the exceedingly complex problems posed by neonatal Ebstein's anomaly. The opportunity and burden of managing this condition in its most severe forms in fetal life presents itself rarely. We learned a great deal in our strategies with this patient and attempted in this report to provide another option for those groups presented with this unique challenge. Hornberger LK, Sahn DJ, Kleinman CS, Copel JA, Reed KL. 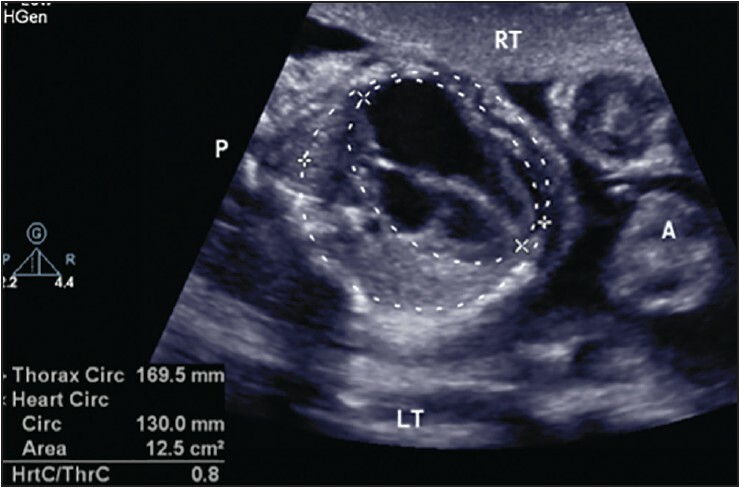 Tricuspid valve disease with significant tricuspid insufficiency in the fetus: Diagnosis and outcome. J Am Coll Cardiol 1991;17:167-73. Wald RM, Adatia I, Van Arsdell GS, Hornberger LK. Relation of limiting ductal patency to survival in neonatal Ebstein's anomaly. Am J Cardiol 2005;96:851-6. Celermajer DS, Cullen S, Sullivan ID, Spiegelhalter DJ, Wyse RK, Deanfield JE. Outcome in neonates with Ebstein's anomaly. J Am Coll Cardiol 1992;19:1041-6. Paranon, S, Acar P. Ebstein's anomaly of the tricuspid valve: From fetus to adult: Congenital heart disease. Heart 2008;94:237-43. Pavlova M, Fouron JC, Drblik SP, van Doesburg NH, Bigras JL, Smallhorn J, et al. Factors affecting the prognosis of Ebstein's anomaly during fetal life. Am Heart J 1998;135:1081-5. Andrews RE, Tibby SM, Sharland GK, Simpson JM. Prediction of outcome of tricuspid valve malformations diagnosed during fetal life. Am J Cardiol 2008;101:1046-50. Truong UT, Hintz SR, Tacy TA. Ebstein anomaly in the fetus: Preparing for the perfect storm. Neo Rev 2011;12:e260-9. Vogel M, Wilkins-Haug LE, McElhinney DB, Marshall AC, Benson CB, Silva V, et al. Reversible ductus arteriosus constriction due to maternal indomethacin after fetal intervention for hypoplastic left heart syndrome with intact/restrictive atrial septum. Fetal Diagn Ther 2010;27:40-5. Atz AM, Munoz RA, Adatia I, Wessel DL. Diagnostic and therapeutic uses of inhaled nitric oxide in neonatal Ebstein's anomaly. Am J Cardiol 2003;91:906-8. Bove EL, Hirsch JC, Ohye RG, Devaney EJ. How I manage neonatal Ebstein's anomaly Semin Thorac Cardiovasc Surg Pediatr Card Surg Annu 2009:63-5. Plowden JS, Kimball TR, Bensky A, Savani R, Flake AW, Warner BW, et al. The use of extracorporeal membrane oxygenation in critically ill neonates with Ebstein's anomaly. Am Heart J 1991;121:619-22. Aphinives P, Tontisirin C. Extracorporeal membrane oxygenation for postoperative cardiac support in Ebstein's anomaly: A case report. J Med Assoc Thai 1994;77:334-6. Di Russo GB, Clark BJ, Bridges ND, Godinez RI, Paridon SM, Spray TL, et al. Prolonged extracorporeal membrane oxygenation as a bridge to cardiac transplantation. Ann Thorac Surg 2000;69:925-7. Carmichael TB, Walsh EP, Roth SJ. Anticipatory use of venoarterial extracorporeal membrane oxygenation for a high-risk interventional cardiac procedure. Respir Care 2002;47:1002-6.